Lewis Hamilton and Valtteri Bottas race to a perfect result on Mercedes home turf at Hockenheim, scoring a 1-2 finish after Ferrari's Sebastian Vettel slithered into the barriers on lap 52. After starting from P14, Hamilton stormed through the field to claim his 66th career victory – his fourth of the 2018 season and fourth at the German Grand Prix, equalling Michael Schumacher’s record for most F1 wins at the race. With this win Hamilton took the lead of the Drivers’ Championship by 17 points from Vettel (171 points). 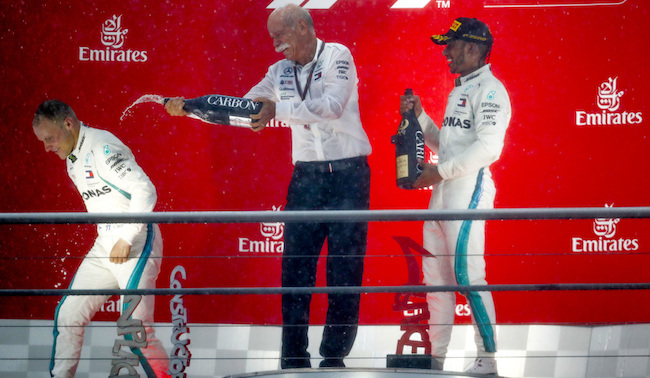 Todays’ result marks the 80th win in Formula One for Mercedes-AMG Petronas Motorsport, the 60th fastest lap for the team and the 125th podium in the series for Hamilton. Mercedes claim the lead in the Constructors’ Championship, leading Ferrari (302 points) by eight points. "I’ve never experienced a race quite like this," says Hamilton. "I knew sitting on the grid that I had to catch the guys at the front – that was my goal. I did a very long first stint, but I had to stop just before it started to rain as the tyre just couldn’t hold out any longer. It rained more and more and it was so tricky out there, but I’d come so far, there was no way I was giving it up. "To get the 1-2 for Mercedes, especially on a weekend when the Team showed their confidence in us by re-signing us, is tremendous. I would never have thought you could do something like that today but I just kept pushing, I kept believing and it happened. I prayed as I always do before the race, and it feels like those prayers were answered. There was a lot of negativity this weekend, but I feel like the rain has come down and washed away all of that negativity. It’s been a real dream and a day I’ll always remember."